Fast results. 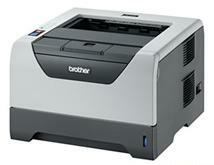 Operating at print speeds up to 32 pages per minute, this printer is ideal for a busy office. Outstanding print quality. The HL-5340D delivers up to 1200 x 1200 dpi resolution so that all of your printed materials look their best. Maximum compatibility. Offering PCL6 and BR-Script3 (PostScript3) emulations, the HL-5340D can support virtually any office or graphics application.